1952: Douglas Fairbanks Jr declares, ‘Savile Row has recaptured the tailoring supremacy of the world.’ Fairbanks Jr is one of the 20th century heroes of Savile Row. It is recorded in Anderson & Sheppard’s ledgers that he recommended Marlene Dietrich to the firm when she was in England making the Russian revolution epic Knight Without Armour. 1953: Queen Elizabeth II is crowned with the tailoring firms Wilkinson & Son (owned by J. Dege & Sons) and Ede & Ravenscroft in attendance at Westminster Abbey to dress the monarch, visiting royals and peers of the realm for what is the most elaborate ceremonial occasion in the nation’s calendar. The military uniforms, the ambassadors’ court dress and national and colonial liveries on display show off the mastery of the grand old Savile Row houses of Henry Poole, Davies & Son and Welsh & Jeffries. 1955: Hardy Amies is granted The Queen’s Royal Warrant and remains court dressmaker until his retirement in 2002. 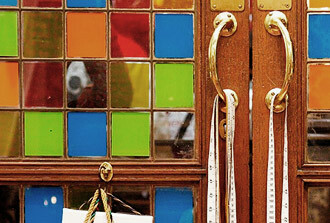 Stanley Lock takes over C E Phipps, which was founded in 1898 to produce embroideries for the burgeoning fashion industry. 1958: G.J. Cleverley & Co, Savile Row’s preferred bespoke shoemaker, opens at 27 Cork Street in Mayfair. The firm goes on to make shoes for Sir Winston Churchill, Laurence Olivier, Fred Astaire, Clark Gable and Sir John Gielgud. 1959: Kilgour, French & Stanbury create Cary Grant’s iconic suits for Alfred Hitchcock’s North by Northwest. Savile Row is recognised as the pinnacle of masculine elegance by cinema goers worldwide and North by North West and Grant achieve for bespoke Savile Row tailoring what Audrey Hepburn and Breakfast at Tiffany’s did for haute couture and ‘the little black dress’ two years later in 1961. 1961: Tragedy strikes Henry Poole & Co. The lease expires on Poole’s Savile Row palace and the company is forced to relocate to Cork Street. Despite protests in The Daily Telegraph, Poole’s inexplicably unlisted building is raised to the ground. Lost during this period are the patterns cut for iconic Poole customers Napoleon III, Wilkie Collins, Charles Dickens and Edward VII. Mercifully, the firm’s ledgers survive. Hawes & Curtis predict a glowing future as a ‘first class tailor’ for apprentice John Pearse. Instead, Pearse drops out, tours Europe, then opens the infamous boutique ‘Granny Takes A Trip’ in the Kings Road in 1965, where he dresses Jimi Hendrix, Bob Dylan, The Rolling Stones and The Beatles. 1963: Maurice Sedwell opens his shop on Savile Row. 1966: H. Huntsman & Sons is invited to make bespoke suits for the England football team which wins the World Cup. 1967: Tommy Nutter and Edward Sexton meet as salesboy and cutter respectively at Donaldson, Williams & Ward in Burlington Arcade. They will go on to form the most creative partnership in Savile Row’s history. 1969: Nutters of Savile Row opens on Valentine’s Day and unleashes the Tommy Nutter/Edward Sexton style on swinging London. Backed by Cilla Black and The Beatles’ record company Apple’s executive Peter Brown, Nutters of Savile Row dresses the entire social spectrum from the Duke of Bedford and Lord Montagu to Mick and Bianca Jagger and The Beatles. Nutters is the first shop on Savile Row to pioneer ‘open windows’ and exhibits some wild displays by Simon Doonan. Mount Street bespoke tailor to the stars Douglas Hayward dresses Michael Caine in the famous bullion robbery caper The Italian Job. Caine’s skinny suits and tone-on-tone white shirt and tie combinations set a cocky, sharp tailored style that resonates today. 1971: Maverick screen actress Katherine Hepburn, whose long-term lover Spencer Tracey was a customer of Huntsman, takes the extraordinary step of ordering bespoke denim jeans from her late lover’s Savile Row tailor. Hepburn’s commission foreshadows bespoke denim collections launched in 2006 by Timothy Everest and Evisu. Huntsman’s very stylish Head Cutter Colin Hammick tops Savile Row devotees Rex Harrison, Lord Snowdon and the Duke of Windsor in Tailor & Cutter magazine’s prestigious best dressed list. 1974: Gieves Ltd acquires Hawkes (and the precious freehold of No 1 Savile Row) and becomes Gieves & Hawkes.Tommy Nutter seeks sanctuary at Kilgour, French & Stanbury after his acrimonious exit from Nutters of Savile Row. 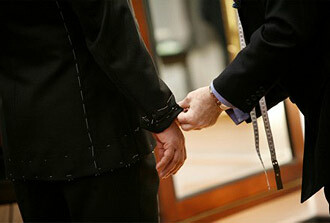 Kilgour also incorporates the famed hunt tailoring specialist Bernard Weatherill. Nutters of Savile Row continues with Sexton, Roy Chittleborough and Joseph Morgan. Maurice Sedwell hires Trinidad-born Andrew Ramroop who will go on to become Managing Director and a Professor of tailoring at the London College of Fashion. 1976: Gieves & Hawkes and Anderson & Sheppard alumnus Anthony Hewitt opens his own bespoke tailoring shop on Savile Row, A.J.Hewitt. The company prospers thanks to the Middle Eastern oil boom and the advent of young cutters Ravi Tailor and James Levett in 1979. 1978: 007 actor Roger Moore becomes a tax exile and invites his friend and tailor Douglas Hayward to his Cote d’Azur villa to dress him for the next James Bond film For Your Eyes Only. It is acknowledged that Hayward’s back-to-classic navy pinstripe three-piece suit is Bond at his sartorial best. 1979: Davies & Son is forced to leave its handsome Hanover Street townhouse where a private room had been set aside for King George V that was fitted with a tube not dissimilar to a hose pipe to communicate with the tailors upstairs. While clearing out the attic sets, which were reserved as places of assignation for titled customers to meet their mistresses, the firm discovers a bill for Sir Robert Peel (founder of London’s first police force) from 1829. 1980: A year into Margaret Thatcher’s reign as British Prime Minister, Andrew Ramroop becomes unofficial tailor to half the Tory Cabinet, which restores a pride in Savile Row bespoke tailoring to the corridors of power in the Palace of Westminster. 1981: H.M.Sultan Qaboos of Oman confers his exotic Royal Warrant on J.Dege & Sons. In arguably the most exotic commission conferred on a Savile Row tailor, Sultan Qaboos commanded Dege & Skinner to create uniforms for his Royal Oman Police Camel Pipe Band. 1981: H.R.H. The Prince of Wales marries Lady Diana Spencer at St Paul’s Cathedral. Gieves & Hawkes make the uniform for Prince Charles while the pageboys – including Lord Frederick Windsor and Edward van Cutsem – are dressed in Naval Cadet uniforms that were originally made by the firm for Prince Charles’s Grandfather King George VI and his Great Uncle The Duke of Windsor when they served as Royal Navy Cadets aboard H.M.S. Britannia. Roy Chittleborough & Joseph Morgan part company with Edward Sexton and continue trading under their own names. Edward Sexton opens his shop at 37 Savile Row and cements his reputation as Savile Row’s jet setting export, establishing a formidable business in the United States. 1982: Henry Poole MD Angus Cundey brings the firm back to Savile Row after twenty-years in exile on Cork Street. 1984: 24 year old East Ender Mark Powell opens Powell & Co on Soho’s Archer Street. His look – a re-mix of sartorial influences such as Neo-Edwardian, 30s Mobster and 60s Kray twin chic – pays homage to the creativity of Tommy Nutter and paves the way for the new generation of Savile Row tailors of the 1990s. 1985: After an encounter with Federico Fellini in Rome and a subsequent career as a maverick filmmaker, John Pearse returns to tailoring and opens a shop on Soho’s Meard Street. 1990: H.R.H. The Prince of Wales appoints Welsh & Jeffries his military tailor. 1992: Richard James, the first of the ‘New Generation’ tailors, opens a shop on Savile Row. James introduces Saturday opening (a revolution on Savile Row) and a fashionable edge not seen since the house of Nutter’s glory days. Tommy Nutter dies. As a fitting epitaph, the outlandish purple suit Jack Nicholson wears playing The Joker, which was one of Nutter’s final commissions, appears on screen in Tim Burton’s Batman Returns. 1996: Ozwald Boateng unleashes his exotic, electric concept of Bespoke Couture on Savile Row from his new shop at No 9 Vigo Street. 1997: Ozwald Boateng, Richard James and Timothy Everest are christened ‘The New Generation’ on Savile Row and photographed by Michael Roberts for the London Swings Again issue of Vanity Fair. Alan Bennett buys Davies & Son, and incorporates Johns & Pegg, James & James, and Wells of Mayfair. Gianni Versace is shot dead outside his Miami palazzo. It emerges that in his later years the designer had become a bespoke customer at J. Dege & Sons (now Dege & Skinner), in addition to buying made-to-measure from Richard James. Diana, Princess of Wales is tragically killed in a car accident with Dodi Al Fayed in Paris on August 30th. Orders under construction for the Princess that were never collected are still held by Maurice Sedwell on Savile Row, John Lobb on St James’s Street and Turnbull & Asser on Jermyn Street. 1998: A.J. 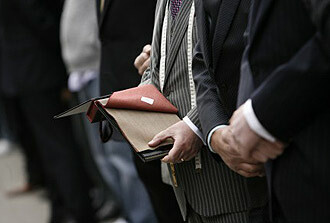 Hewitt acquires the colonial bespoke tailoring specialist Airey & Wheeler.